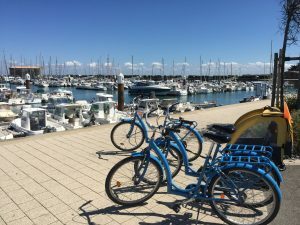 With picturesque views of its Atlantic coastline, flat salt marshes, windmill laden countryside and a rich history that has survived war, revolution and invasion the Vendee is the perfect location to host the Tour De France; and the best part is, here at Votre Vacances, we are ideally situated for the first 3 stages of the 2018 TDF, starting on Saturday 7th July. The Grand Depart takes place only an hour away at the award winning theme park, Puy du Fou, famed for its full size Roman Amphitheatre, Bird of Prey show and Viking Village. Further north is the paradise island of Noirmoutier, and is the starting place of Stage 1. The ile has golden beaches, traditional villas and impressive fort that stands tall in the centre ville. 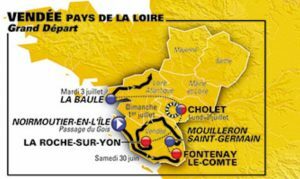 Stage 1 ends at Fontenay le Comte is an easy drive from us here in Saint Julien des Landes, and could provide a challenging hill climb through the narrow Renaissance streets. The town is also home to the impressive Chateau Terre Neuve and its impressive terracotta Greek goddesses. 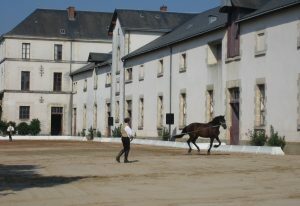 Stage 2 commences in the traditional town of Mouilleron Saint German with salt marshes, windmills and flat countryside terrain, and heads t Napolean’s La Roche sur Yon, famed for its grid system layout, grand French maisons and of course Le Haras de la Vendee, and impressive spectacle of French horsemanship. 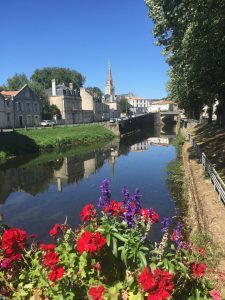 Cholet provides the start and finish of Stage 3 and is the capital of military Vendee, with the old ramparts still remaining in the lower part of the Jardin du Mall. 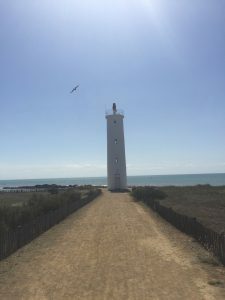 Stage 3 will showcase the turbulent history of the Vendee, a region torn apart by war and revolution, and the subsequent rebuilding of a nation. We provide the ideal base for those wishing to follow the Tour, or simply incorporate it into a holiday. Our accommodation is perfect if you’re travelling as a family or as part of a cycling club, for more information about our accommodation, read our blog about our accommodation.